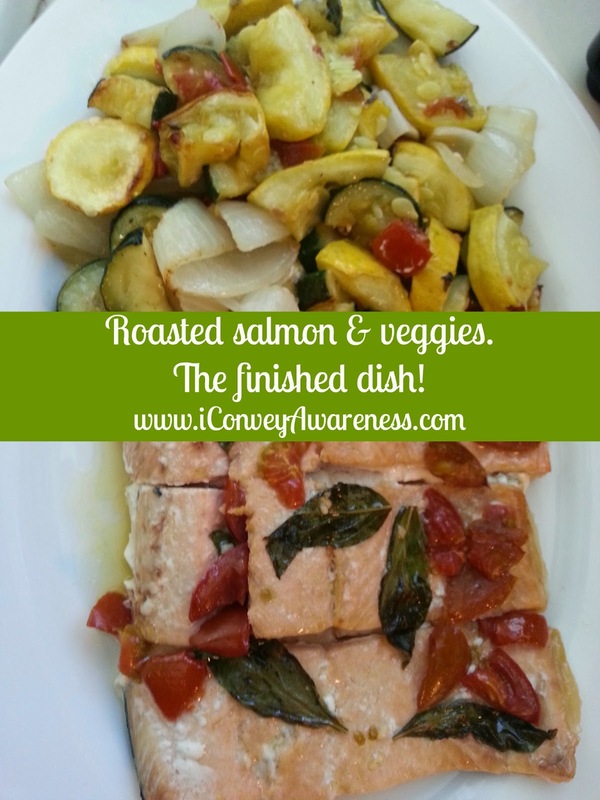 Before we go any further, give me a moment to share the recipe for the salmon and veggies. 1. Let's make the basil 'sauce' first. Prepare the basil leaves - rinse and dry (leave whole). Dice 3 small tomatoes (or 1 large) and smash the garlic then dice. 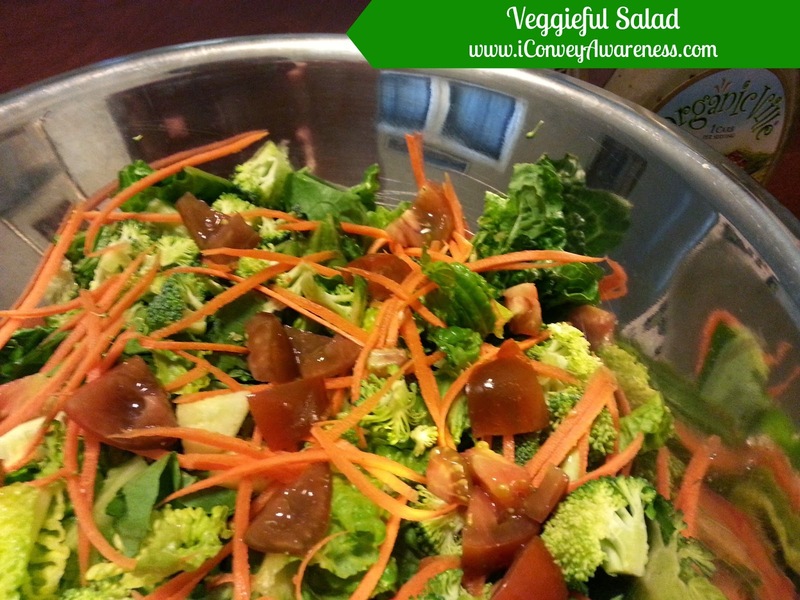 Put all together in the bowl and let it marinate while you prepare the other veggies and salmon. 2. Now that your 'sauce' is made, you'll prep the potatoes. I used the 3 potatoes in the image above. Pre-heat the oven to 375*. After the potatoes have been cut into 1 inch chunks, lightly salt then toss them with some of the basil sauce (about a tablespoon). Place in the oven uncovered. You will need to make sure to flip the potatoes in 20 minutes for even cooking / browning. 3. While potatoes are cooking, prepare the rest of the veggies: onion, zucchini and squash. Dice into 1 inch chunks like you did with the potatoes. Lightly salt the zucchini and squash to keep from browning. 5. Check on the potatoes. Do they need flipping? Has the 'sauce' dried out? Add more as needed. 6. Place the salmon and veggies uncovered in the oven and cook until the fish flakes with a fork or about 25 minutes. Potatoes will be done at this time too. Remove the basil leaves if you don't want to eat them whole. I say that this dinner is a winner not only in that it tasted great but it provided me EIGHT different veggies! There were 4 with the salmon: onions, tomatoes, zucchini, and squash and there were four with the salad: lettuce, carrots, cucumbers, broccoli, and (not counted twice) tomatoes. 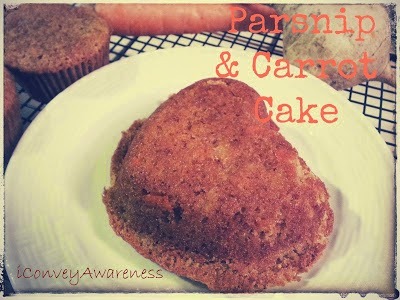 For dessert, I made parsnip and carrot cake (like this). Parsnips seem to taste best (IMO) in a dessert. They take on a completely different taste (and texture) when baked. So, if you don't like parsnips, you may like them in this dish! Last note worth mentioning: I recently shared with another family that priorities may need to be shifted if one thinks that real foods are 'expensive.' When families save their money the entire year to go on vacation but yet eat poorly throughout the year, I think we've got our priorities twisted. If given a choice, I'd choose budgeting for real foods than to go on an elaborate vacation. I firmly believe that if you want something, you'll find a way to pay for it. Plus, who knows, you may be able to eat well every day and go on a vacation to enjoy the fruits of your labor. My end point is this: Choose wellness! 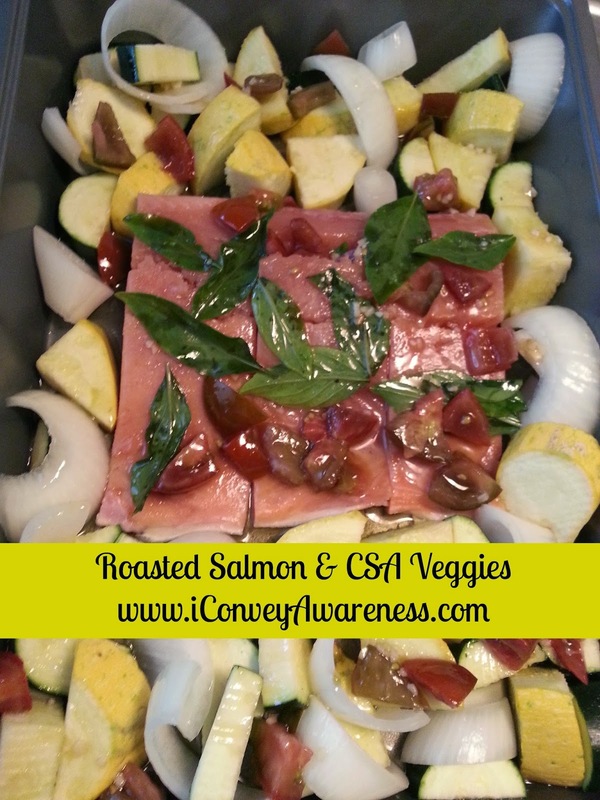 I love the salmon and veggies idea! 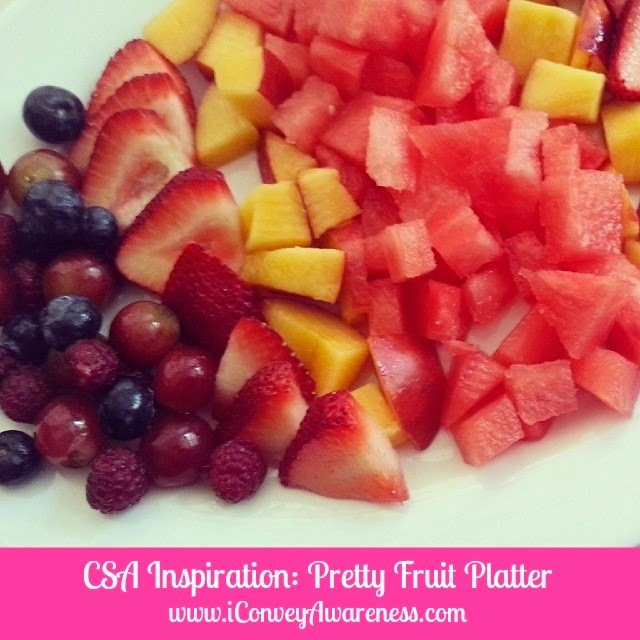 Thanks so much for sharing these great tips with the Let's Get Real party. 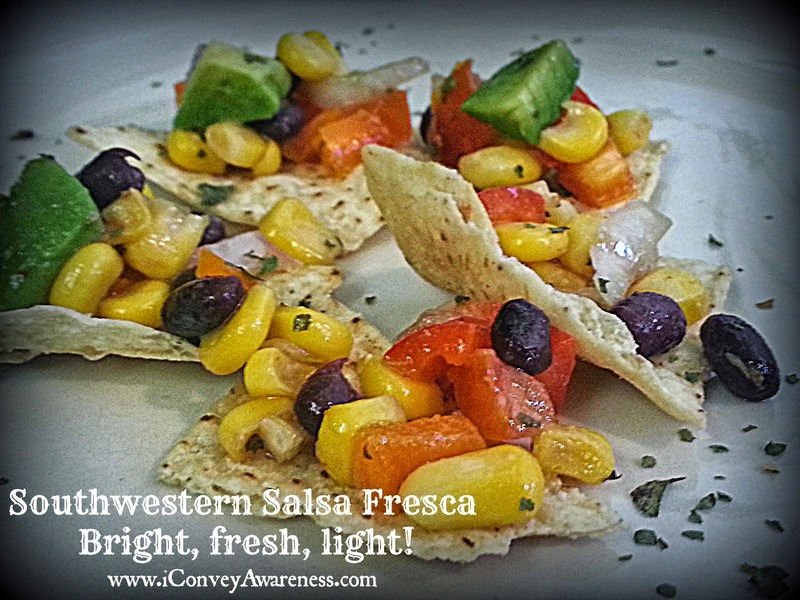 I love my CSA veggies too. I've hardly bought any veggies from the grocery store this summer so far, which is great. I've been supplementing my share with the farmer's market mainly...we go through a ton of veggies here! Thanks for all the wonderful tips! 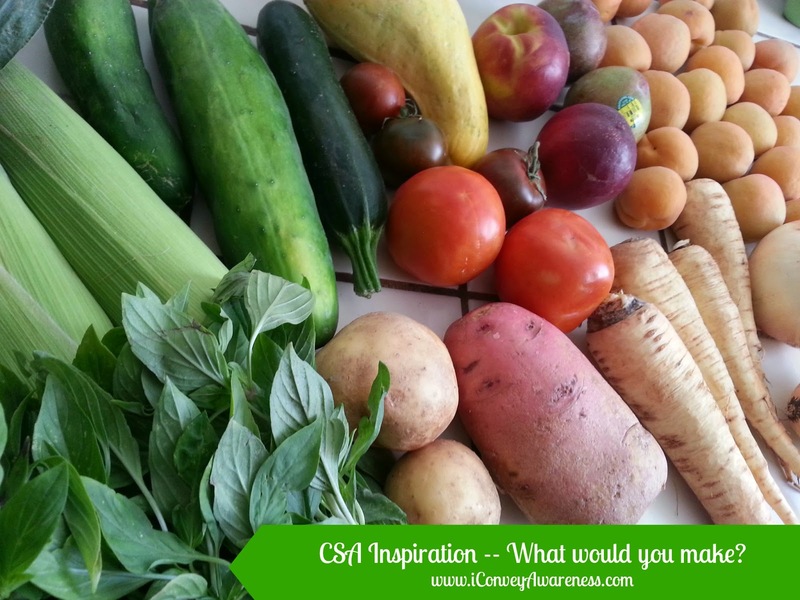 When the CSA box arrives it almost feels like Christmas in July! It's so much fun creating healthy and delicious meals with these wonderful, fresh food items so thank you for sharing your delectable recipes with us at the Plant-based Potluck Party. I appreciate it.